1. Why should I use the ART Deals Community? The sales that you get on Amazon are critical to the success of your business. Over 55 percent of product searches start on Amazon with keywords. However, when launching a product it can be difficult to get seen by shoppers and get traction for your product. So, when launching a new product on Amazon, your future success will depend on getting your product in the hands of real shoppers. We created the ART Deals Community to give you an edge on your competition by allowing you to get your product in the hands of real shoppers that care about the success of your business and products. Our Deals Community is an ethical network of shoppers where you can offer heavily discounted and free products to real shoppers. The ART Deals Community is the perfect way to launch your new products and increase sales. We have a large number of shoppers in our network and they are extremely eager to try new products, share their experience with friends and families and help boost your sales. 2. Is “Promotions” and ART’s Deals Community within Amazon’s terms of service? Yes! We have structured the Deals Community to be in compliance with Amazon’s TOS and the Promotions Tool is one of the best ways to promote your product to real shoppers, increase sales of your products and dominating your competition. 3. Which AMZFirst plan gives me access to the ART Deals Community? This feature is available for all AMZFirst users on the “Basic” ($50/m) and up plans. If you need to upgrade your account please see Q: How can I change my plan? 4. How many sales can I get using the Promotions tool? The AMZFirst Promotions tool is available for all sellers. However, we can’t guarantee the number of sales from the ART Deals Community shoppers as this will greatly depend on your product and the discount you offer. Our industry leading “Promotions” tool will help you edge your competition and launch your new products into the worlds largest deals community. 5. 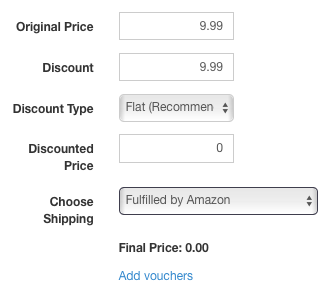 Does Amazon still take the FBA fee when I sell my product for $1? Yes, the Amazon FBA fees apply to every order. The fees are partially based on the final cost of the product. Therefore even if you sell it for $1, there will still be Amazon fees. However, they should just be a lot less then if you sell at full price. You can use this Amazon FBA Fee Calculator as a guide to the fees based on changes to your items price. You will notice that some fees, such as “Order Handling” stay the same regardless of price changes. 6. Can I use FBM or only FBA? 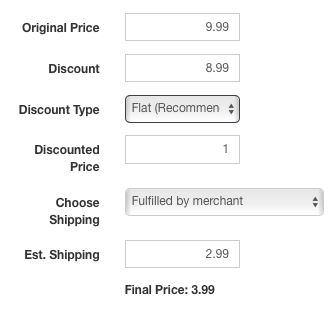 How do I display any shipping charges? You can use fulfilled by merchant (FBM), but we warned that the response rate will be lower than fulfilled by Amazon (FBA). Many shoppers have Amazon Prime accounts and are accustomed to free two-day shipping. Having to pay for shipping could act as a deterrent to potential shoppers. We have now updated the Promotions setup to show’Shipping’ details for the seller. For FBA sellers, you don’t need to add any shipping. Simply check that the auto selection has picked up the correct shipping method of FBA. For FBM, shipping by merchants, you will need to disclose if any shipping is charged. Check that the auto selection has picked up the correct shipping method of FBM. Enter your estimated shipping cost into the ‘Est. Shipping’ textbox. This can be zero if shipping is free. The ‘Final Price’ will be displayed below. Example 1. Free product with $2.99 shipping. Example 2. $1 product with $2.99 shipping. 7. Will this work for any other Amazon stores besides the U.S? We will also add other country specific clubs soon! 8. Does this work for Kindle books and other digital products? Ok, so with kindle books or ebooks you can not use the ART Deals Community, this is because Amazon does not allow coupon codes to be created for them. But, the other tools still work great. You can track rankings, use Super URL’s, on-page analyser, keyword research and a lot of the other great features no problem. Our new autoresponder feedback tool, Rocket Reply and Merchant Metrics, that will very soon be included free of charge with all current AMZFirst subscriptions, can also be used. 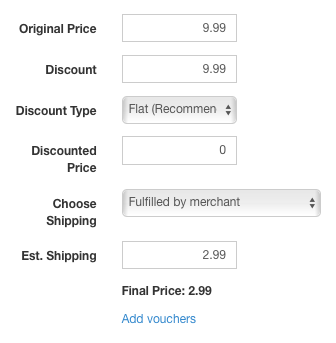 For digital products, if you are able to create a coupon code, then you can use the Deals Community. If not, this is won’t work. Some sellers have suggested the use of Gift Cards, however, our system is not designed for this use. 9. How can I hide my brand and keep my listing more private? There are a few things you can do to conceal your Promotions listing in the ART Deals Community from the public. You are able to edit and change the title, description and everything when you set up the promo. You can remove brand name and any details that will link it to you. Also you can choose not to show the link to the Amazon page, by using the ‘No URL’ function. You could also remove the names from the details and just have an image of the product. Note: The only thing that can’t be changed is the images. They are fixed and pull through from your Amazon listing. Shoppers need to be able to see the exact product they are requesting to purchase. 10. I’m a vendor not a seller. Can I use the Promotions tool? It appears not. As a vender, you use Amazon Vendor Central and not the Seller Central. As a vendor, you don’t have the ability to create coupon codes and therefore you can’t use our ART Deals Community. However all other functions of the tool will work just fine. 11. How Do I Get Started launching a product? After signing up, you can set up a promotion in the Deals Community and offer your product at a discount to real shoppers. The ART Deals Community is the worlds largest network of shoppers and we’ll help get your product into the hands of shoppers who have an interest in your product. As more shoppers purchase your product, you will start to see your sales increase, this will help increase your rankings. And, then, if you’ve done your homework and created a product that does what you said it will do, it shouldn’t be a problem to get more sales and gain traction for your product. If you’re getting a lot of bad feedback, you need to take an honest look at your product and your process and see what’s causing your customers to be unhappy, and then fix it! 12. Can I Become a Shopper? Where Can I Sign Up?